Our gardens will delight you, naturally! 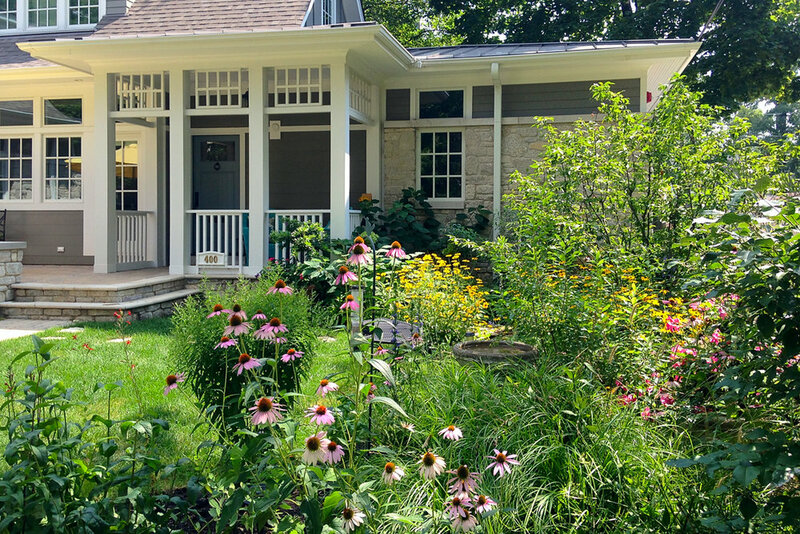 We design, build, and care for native plant gardens and complementary elements such as stone and brick walls and patios, pergolas and arbors. Our gardens hum with birdsong and the flutter of butterflies and bees because native insects need native plants to survive, and birds require those insects for their young. A well-cared-for native garden is a special place. Flowers bloom in waves of color and grasses sway in the wind. Majestic or delicate, colorful or subtly textured, each of our native plants has a personality honed from its long-held place in our ecosystem. And there is a native plant palette for virtually any type of soil, sun exposure, or moisture. Native wildlife everywhere evolved with native plants, and many species require specific plants. We can welcome the creatures that share the world with us into our gardens and our corporate and institutional campuses by replacing lawn, imported shrubs, and annual flowers with the wildflowers, grasses, and native shrubs and trees that support the full lifecycle of our butterflies, bees, and birds. And the resulting gardens can be stunningly beautiful! At Red Stem, we imagine cities and towns full of native plant gardens that provide respite for not only wildlife, but people, too. We have evolved with the songs of birds and the charms of butterflies all around us, and these lovely sights and sounds naturally bring us delight.